The ASU+GSV Summitt in San Diego (8-10 April 2019) is a landmark event on the US education technology calendar. Austrade, in partnership with EduGrowth, will bring a delegation to attend the conference and participate in a targeted mission to New York, Washington DC, San Francisco and San Diego. This is an opportunity to meet potential partners, investors and customers, and learn how others are advancing education utcomes globally. ASU+GSV is one of the most comprehensive and leading edtech conferences in the US, attracting upwards of 5,000 attendees accross the education and investment spectrum. 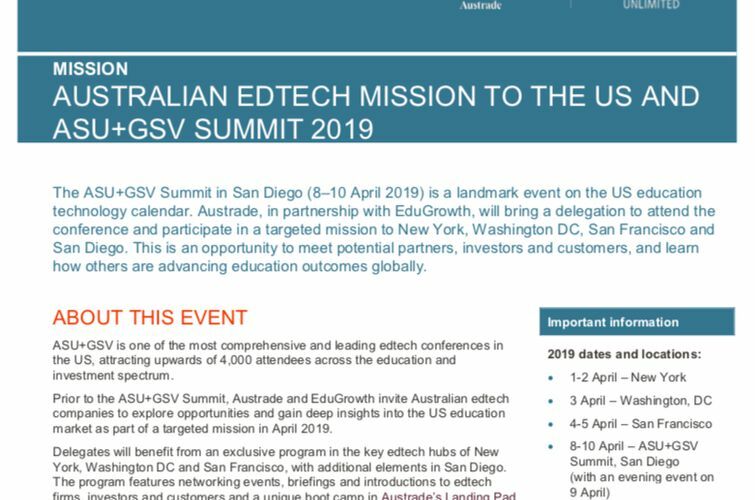 Prior to the ASV+GSV Summit, AusTrade and EduGrowth invite Australian edtech companies to explore opprtunities and gain deep insights into the US education market as part of a targeted mission in April 2019. Delegates will benefit from an exclusive program in the key edtech hubs of New York, Washington DC and San Francisco, with additional elements in San Diego. The program features networking events, briefings and introductions to edtech firms, investors and customers and a unique boot camp in Austrade's Landing Pad. Learn about the opportunities and challenges of doing business in a large and decentralised market, including a boot camp run by the San Francisco Landing Pad. Develop market insights and your understanding of key US edtech markets including New York, Washington DC and San Francisco. Promote innovative Australian edtech solutions to a US audience. Consult with possible funders and/or partners for growth/expansion. Attend workshops focused on funding options and opportunities, identifying key decision makers and influencers, distribution channels, and sales. Meet and build relationships with leading multinational corporations, universities, accelerators, potential partners, investors and customers. Leverage Austrade's networks and on-ground support to help advance your business interests. Bookform: Online Social Emotional Learning projects where students collect stories and photos from family and community, using voice-to-text AI & collaboration, to automatically create printable digital books. Youth disengagement and depression is epidemic and the Bookform projects scaffold youth to engage in more meaningful communication with their family, peers and community, to develop foundational relationships, empathy, resilience and identity. Students use technology as a tool to create original content in a modern format they are proud to share and families can treasure forever. The Favourite Recipe Book– students collect their family’s favourite recipes and the stories about why that food is special. The Family Book– students ‘interview’ family members to collect personal stories about their childhoods, careers and life lessons. Invited others can also contribute content & photos directly into the book. Community Service Project– students go into the community to help an individual create their memoir or a group to collate their cultural stories. The process of authentic intergenerational engagement empowers our youth to develop valuable life skills, for success in any environment. The polished book products have tangible value for everyone and are presented at ceremonies or sold for fundraising.